The Congress of Dibra (original name promoted by the Ottoman authorities: Ottoman-Albanian Joint Constitutional Congress) was a congress held by members of Albanian committee in Debar (than part of Ottoman Empire, now part of the Republic of Macedonia) from July 23 to July 29, 1909. The congress was chaired by Vehbi Dibra, mufti of the Sanjak of Dibra and was sponsored by the government of the Young Turks. It was held on the first anniversary of the Young Turk Revolution and was a countermeasure on the Latin script based Albanian alphabet which came out of the Congress of Manastir. The Young Turks wanted Albanians to stay loyal to the Ottoman government using peaceful means. The Albanian members of congress were divided in attitudes: the pro-Ottoman part wanted to sign the program proposed by Young Turks, while the more patriotic members demanded more rights such as greater autonomy, Albanian schools, tax reforms, construction of roads, permission to retain their own weapons etc. On the sixth day of the Congress, the assembly approved a resolution with 5 points from the Young Turks programme and 12 points proposed by representatives of the Albanian patriots. Historians are still divided on the outcome of the Congress of Dibra. 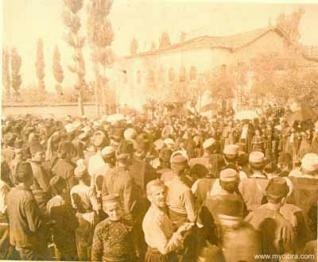 The patriotic press of that time described the Congress as a puppet of Young Turks, however current historians have tended to assert that the congress was important since it allowed the teaching of Albanian in schools, making the Albanian language official within the Ottoman Empire for the first time. Jacques, Edwin (1994). The Albanians: An Ethnic History from Prehistoric Times to the Present. p. 266. ISBN 0899509320. Torte, Rexhep (2009-08-04). "Përfundoi shënimi i 100-vjetorit të Kongresit të Dibrës". Albaniapress.